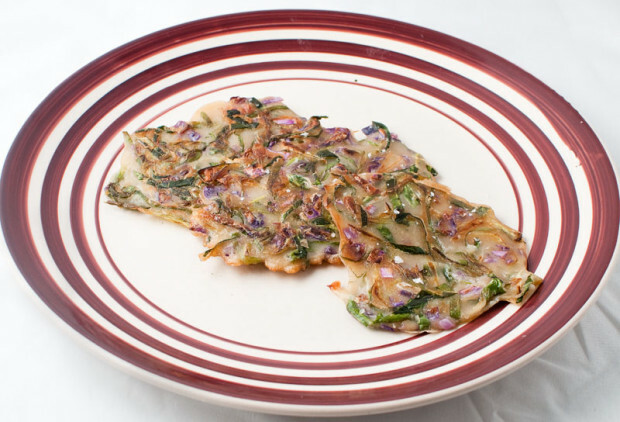 Jeon is the Korean version of a savory pancake. It’s really simple to make and so good to eat. One of my favourite versions is this kimchijeon from Maangchi. However, sometimes you want something without the spice and that’s where pajeon comes in. Pa means green onion and the following vegetarian recipe (many versions include shrimp, but I’m not a seafood person) incorporates that wonderful vegetable. Below, I’ve listed buckwheat flour as an ingredient. Buckwheat flour is gluten-free and a vegan option for this recipe. However, you can use regular wheat flour instead, or even a mix of buckwheat and wheat flour. Also, if you need a gluten-free or vegan dish, make sure you use the appropriate soy sauce. Mix the flour, sugar, soy sauce, salt and water together to form a paste. Dollop three spoonfuls of the mixture into the pan and flatten slightly. Each dollop should be spaced away from each other to make three small pancakes. Press down on them with your spatula. Cook each pancake until nicely browned on the bottom and a little crispy. Flip the pancakes and brown the other side, pressing down as needed. Once cooked, transfer to a plate and lightly season with some salt. Repeat steps 4-6, adding more oil as needed. Eat right away with the below dipping sauce, or allow to cool and save for breakfast or lunch the next day. Filed under: Maggie O'Driscoll, The Main Dish, Uncategorized, What's Cooking?